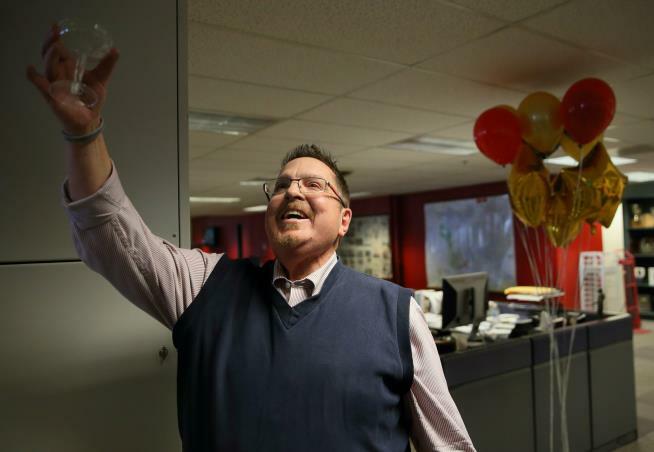 (Newser) – The South Florida Sun Sentinel and the Pittsburgh Post-Gazette won Pulitzer Prizes on Monday and were recognized along with the Capital Gazette of Maryland for their coverage of the mass shootings in 2018 at a high school, a synagogue, and a newsroom itself, the AP reports. The AP won in international reporting for documenting the horrors of Yemen's civil war, while the New York Times and the Wall Street Journal were honored for delving into President Trump's finances. The Florida paper received the Pulitzer in public service for its coverage of the massacre of 17 people at Marjory Stoneman Douglas High School in Parkland. The Post-Gazette won in the breaking news for reporting on the synagogue rampage that left 11 people dead. After the Pulitzer announcement, the newsroom in Pittsburgh observed a moment of silence for the victims. The Sun Sentinel's staff was somber. "We're mindful of what it is that we won for," said editor Julie Anderson. "There are still families grieving." The Pulitzer board also gave the Capital Gazette an extraordinary $100,000 grant to further its journalism. "No one wants to win an award for something that kills five of your friends," editor Rick Hutzell said. The Pulitzers, US journalism's highest honor, reflected a year when journalism came under attack in other ways. Reuters won in international reporting for coverage of a brutal crackdown on Rohingya Muslims by security forces in Myanmar. Reporters Wa Lone and Kyaw Soe Oo are imprisoned for violating the Official Secrets Act. Reuters also won the breaking news photography award for images of Central American migrants. Images of the famine in Yemen brought a feature photography award for the Washington Post, whose book critic, Carlos Lozada, won for criticism. The Los Angeles Times took the investigative reporting prize for revealing hundreds of sexual abuse accusations against a USC gynecologist, who has denied the allegations. The local reporting prize went to the Advocate of Louisiana for work that led to a state constitutional amendment abolishing Louisiana's practice of allowing non-unanimous jury verdicts in felony trials. ProPublica won in feature reporting for coverage of Salvadoran immigrants affected by a federal crackdown on the MS-13 gang. Tony Messenger of the St. Louis Post-Dispatch received the commentary award for columns about poor people being thrown back in jail because they couldn't afford to pay the costs of a previous stint behind bars. The New York Times' Brent Staples received the editorial writing award for writing about the nation's racial history. There SHOULD be NO awards related to tragedy. The picture of the award winner is crass to say the least. I HATE Them.. Who Knew what a Bump Stock was BEFORE Vegas... Today your Grandma know what one it and how it should be desirable to Mass Shooters.. Anyone who thinks that the Future Mas Shooter does not LUST for the Attention of the Present Mass Shooter is a FOOL.. Mass Shooting Techniques , Styles, Tools, and Methods are TAUGHT to every Idiot that wants world fame of MASS Media Attention... All Thanks to NEWS Advertisement.. They can ALL go to HELL!!! !